Since 1967, we’ve been flying the flag for British craftsmanship with our made-to-measure sofas and chairs, made entirely in beautiful Northumberland. When sourcing furniture and furnishings from only the best, choosing a manufacturer which has been awarded the Manufacturing Guild Mark is a good place to start. The Manufacturing Guild Mark has been the mark of excellence, awarded to Britain’s top furniture manufacturers such as ourselves, since 1993. Simple to say, but not so simple to achieve. Holders are expected to attain the highest standards in all aspects of business, which is determined by a rigorous independent audit on application and thereafter repeated every three years. Unlike other Guild Marks, the Manufacturing Guild Mark is awarded to the actual company and not a specific product or product range. 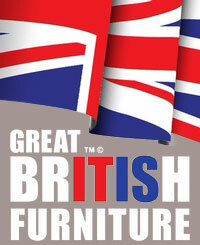 It is also only open to those who manufacture most of their products in the UK. The timber for the hardwood frames is selected and cut at our own sawmill in Northumberland – so we can guarantee the quality of the wood before we even start making your sofa or chair. It also means we can make your frame to your precise specifications. If you want your chaise longue a little longer or your high back sofa a little lower, a deeper seat or a wider arm we’ll make it to your exact specification and your complete satisfaction. We design all our sofas ourselves, combining classical design history with the best of contemporary styles. In our Northumberland workshop, our highly skilled master craftsmen and women hand-make each piece individually with specialist skills perfected over generations. We cut and build the frames ourselves by hand using techniques passed down through the generations. Nothing is pre-cut or off-the-peg. We believe in doing things properly so your piece of furniture will last a lifetime. That’s why we happily guarantee all our frames for 50 years*. *Refers to frame only, please see t&c's for more information. In the beautiful Northumberland countryside, our highly skilled team share our ambition to make sofas of distinction, using specialist skills perfected over generations. Many of our master craftsmen and women have been with us for 20 to 30 years. They stay with us for decades because they take great pride in their work – they love to work with the finest materials and make things of real beauty. Their dedication and experience means they’re proud to put their names to every Delcor piece that leaves the workshop. Master Upholsterer, Graham Barrass continues to pass on his skills to his son Kane who now works alongside him. Graham is proud of every single piece of furniture he’s made for Delcor over the last 30 years and that the tradition is now passing on to the next generation of his family.